McDonald's Big Mac Secret Sauce Revealed! Breaking news: McDonald's in Canada has revealed the secret sauce used in Big Macs, McDonald's signature sandwich! Unless there is a difference between the Big Macs in Canada and the US, this is huge. Recipes like this are usually kept under lock and key. This is like obtaining the recipe for Coca-Cola. 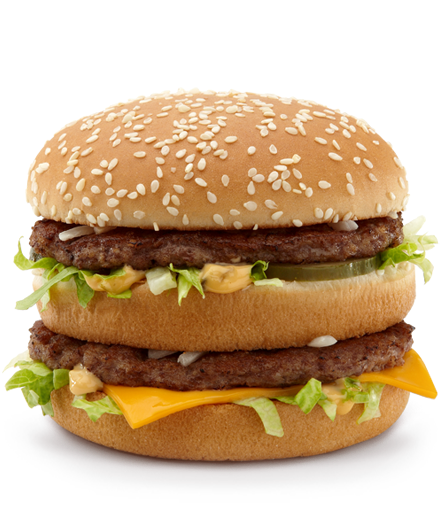 Executive chef Dan Coudreaut of McDonald's demonstrates how to make the Big Mac sauce in the video. Everyone knows that the Big Mac sauce is what makes a Big Mac a Big Mac. Without the sauce, all you have is just a burger with 3 layers of bun and 2 layers of meat. The recipe for the sauce uses everyday ingredients that can be found in any home: sweet pickle relish, yellow mustard, mayo, onion powder, white wine vinegar, garlic powder, and paprika. After shredding lettuce, chopping some onion, and laying out some sliced pickles, Chef Coudreaut cuts a thick bun into three slices and toasts them on a skillet. He presses out a pair of perfectly-shaped beef patties with a cookie cutter and layers everything to create the almighty Big Mac. The video unfortunately does not disclose the exact quantities, but you may be able to eyeball it from the video. My initial estimates for the sauce are: 1/2 cup regular mayo, 4 tbsp relish, 1 tbsp mustard, 1 tsp white wine vineger, 1 tsp onion powder, 1 tsp garlic powder, 1 tsp paprika. Does the main McDonald's headquarters know about this? Why did McDonald's Canada post the video? Could this have been posted by a disgruntled former McDonald's employee or a current employee who had gone rogue? I don't know, but I'll definitely make use of this valuable information to make my own Big Macs. I guess the Big Mac secret sauce wasn't thousand island dressing after all - another myth debunked!